This is a story of one girl’s quest for amazing BBQ ribs in New York City. I was told that Hill Country had “Texas-style BBQ” by a woman I met at The Brooklyn Kitchen condiments class who has toured the country and tasted BBQ all over. I figured this was a solid recommendation. Hill Country 26th Street between Broadway and 6th Avenue, New York, NY. 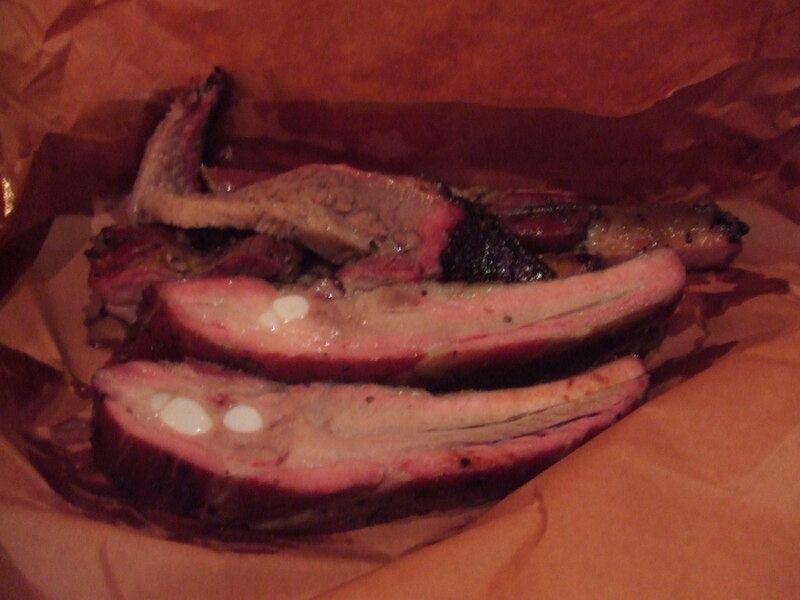 Hill Country is, as mentioned, Texas-style BBQ in a honky-tonk setting. This is a place that sells its own t-shirts at the front register if that’s any indication of the atmosphere. When you sit down at Hill Country they hand you a card with all the menu items, and then you have to visit the meat counter, the sides counter, and the dessert counter to order what you want. You can order as little or as much as you want, from a single slice of brisket and single pork ribs, to a whole game hen and “feed the family” sized mashed potatoes. The ambiance is a down home, down country, honky-tonk, kick up your heels kitsch-fest. But somehow it feels authentic. Verdict: Holy brisket. I think this is what Texas does right. The ribs were satisfactory, and still nothing to write home about, but holy mackerel, the brisket. It was delicious. And Hill Country has three different types of brisket on the menu, so I GUESS I have to go back again to try the other two. 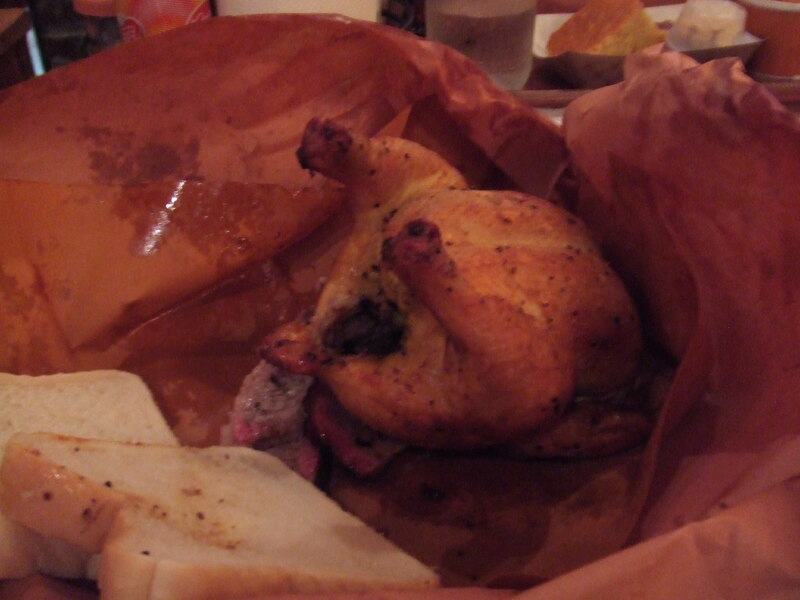 Another standout menu item was the game hen. It was incredibly moist and roasted to perfection with a crispy skin. It should also be noted that Hill Country is perfect for big groups. The pickiest (or cheapest) member of your party can literally order one single pork rib and a beer if they feel like it, and separate checks are a done deal from the start. The service is attentive, the atmosphere is comfortable and welcoming, and the food was decadent and delicious. I almost wanted to start throwin’ around “y’all”s.